Royal Wedding flower girl dresses have made for some interesting contrasts in dresses for flower girls (called bridesmaids in the UK). 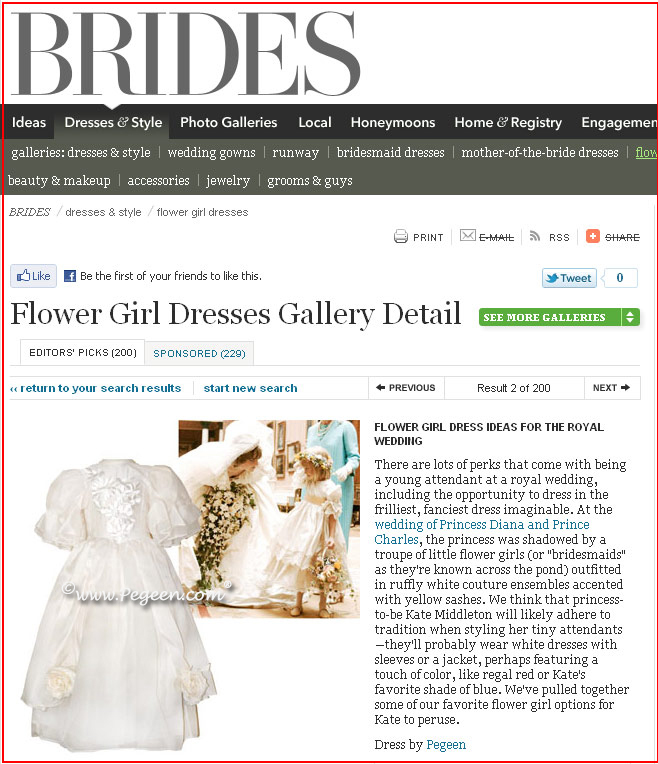 There has been many styles of flower girl dresses presented over the years for different royal weddings. Of course we all remember the photographs from Charles and Diana’s wedding in 1982. Even the ex-Duchess of York had a similar flair. EVERYTHING was bigger in the 80’s including the shoulder pads, thanks to Dynasty. This was in startling contrast to the wedding fashions of the April 29th wedding of the Duke and Duchess of Cambridge (Prince William and Kate Middleton). Prince William’s bride, brought us back to the simplicity and elegance of the gowns of Princess Grace and Queen Elizabeth with a darling open neck and fitted bodice. The new royal’s dress was in fact, magnificent. It had the most wonderful bustle, beautiful embroidery and lace sleeves. The flower girl dresses that were designed for these Royal Weddings have much in contrast and design. We all now know when they were revealed last week, the young bridesmaids for the Windsor’s wedding was simple and elegant with the skirts amazingly similar to the bride. The bit of lace trim and all those covered buttons showed a royal restraint. Princess Grace’s flower girls wore short, knee length dresses with tight bustling at the waist, peter pan collars and tiny yet, puffy sleeves so typical of the 1950’s. At Queen Elizabeth II marriage to Prince Phillip, the children wore kilts. Princess Diana’s flower girl girls were full, layered and with delicate but wide English laces and of course had wide silk ruffling at the neck and on the sleeves. I admit, I was influenced by her wedding and when I was in London for a buying trip in the early 80’s, I scooped up the most magnificent wedding gown in a style between Princess Diana’s and Cinderella while shopping at Harrod’s (to be revealed at my Anniversary Vow Renewal this coming December at Disney…. like Marie Osmond, I have to get back in that gown!). Pegeen® introduces the latest addition to the Regal Collection – our take on the flower girl dresses used in the royal wedding, the “Princess Kate”. The dress has 5 pleats on the sash, made of duchess silk satin or shantung silk, gorded skirt with a wide flair at the bottom and Engish Nottingham lace hem, darling Nottingham lace-trimmed sleeves trimmed with silk covered buttons covering 12 layers of tulle and underpinnings. Pegeen calls this style simply, “Princess Kate” or style #601. 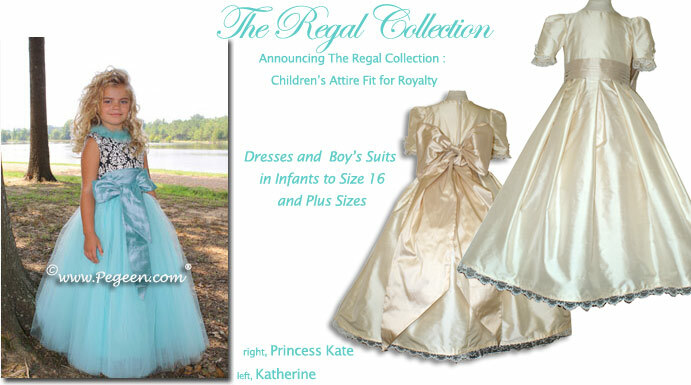 The entire Regal Collection, like “The Katherine” named for Katherine Parr, the last of Henry VII’s wives, can be seen by visiting Pegeen.com for details. There are lots of perks that come with being a young attendant at a royal wedding, including the opportunity to dress in the frilliest, fanciest dress imaginable. At the wedding of Princess Diana and Prince Charles, the princess was shadowed by a troupe of little flower girls (or “bridesmaids” as they’re known across the pond) outfitted in ruffly white couture ensembles accented with yellow sashes. We think that princess-to-be Kate Middleton will likely adhere to tradition when styling her tiny attendants—they’ll probably wear white dresses with sleeves or a jacket, perhaps featuring a touch of color, like regal red or Kate’s favorite shade of blue. We’ve pulled together some of our favorite flower girl options for Kate to peruse. Orlando, FL – April 20, 2011 — The Royal Wedding nuptials of Prince William and Kate Middleton are a little more than a week away. So who are her young attendants? In the UK, young attendants are called bridesmaids whereas in the US, we call them flower girls. So what will they be wearing. It’s a wedding made in fairytale heaven, well at least for some of us. Marg Hyland, founder and head designer of Pegeen® which sells exclusively online as Pegeen.com, has just introduced some very unique designs as she has been doing for almost three (3) decades. This collection, however, includes flower girl dresses and ring bearers’ suits appropriate for any child attending or participating in a wedding planned for the most royal of occasions. For every bride who wants to feel like royalty on her special day: The Regal Collection . . . Inspired by Royalty. Each dress is a totally new design especially for infants and children, made with fabrics such as duchess silk satin, custom made brocades, optional monogramming and other available customizations, feathers and jewels, damask and yards of imported French ribbon and tulle, with names reflecting designs appropriate to different periods in history such as Guinevere, Marie Antoinette, Elizabeth, Grace, Isabella, and even Bloody Mary (a beautiful red flower girl dress which will be perfect for weddings during the holidays). Hyland has introduced a total of ten (10) flower girl dresses, and has even provided two (2) perfect little boys’ period outfits: the James and the William. This collection is expected to quickly become one of Pegeen®‘s most in-demand lines of all time. And considering the current economy, the price is right. These period flower girl dresses start at only $300 and the boys’ outfits at $250. SO, what about the children in Prince William and Kate Middleton’s wedding party? The Royal Bridesmaids: Traditionally, the flower girl will be dressed in complimentary colors to the bride’s wedding theme and will scatter rose petals down the aisle ahead of the bride and just behind the ring bearer. 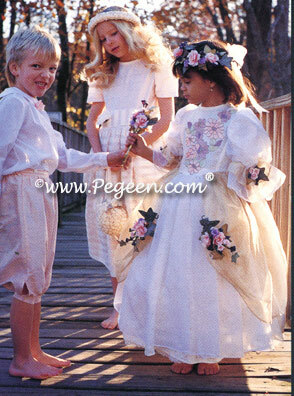 Pegeen carries over 85 styles of flower girl dresses and jr. bridesmaids attire in 200 colors so customizable that every child usually walks down the aisle with a unique and personal vision of loveliness. Grace van Cutsem, Bridesmaid, daughter of Prince Charles’ godson, Hugh van Cutsem, who incidentally was a pageboy in Prince Charles’ and Princess Diana’s wedding in 1981. Also in attendance will be the Honorable Margarita Armstrong-Jones, the 8-year-old is Prince William’s second cousin and the daughter of Viscount and Viscountess Linley. Eliza Lopes, the 3-year-old daughter of Laura and Harry Lopes and granddaughter of Prince William’s step-mother, Camilla Parker Bowles. Lady Louise Windsor, the 7-year-old daughter of Prince Edward, Earl of Wessex and Sophie, Countess of Essex. Lady Louise is Prince William’s first cousin and ninth in line to the throne. The Page Boys: The page boy will carry the bride’s train as she enters the church and proceeds up the aisle. 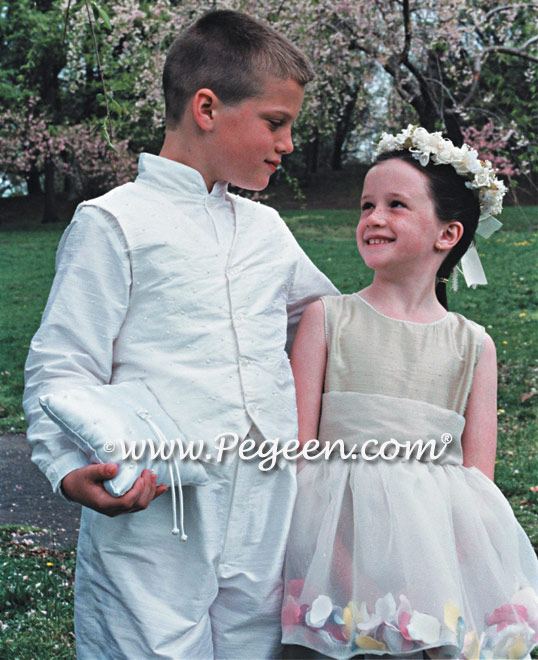 Pegeen designs over 24 of the most elegant and sophisticated outfits for pageboys and ring bearers who’s job it is to carry the rings on a cushion down the aisle in front of the procession. Billy Lowther-Pinkerton, the 10-year-old son of Anthony James Moxon “Jami”‘ Lowther-Pinkerton, who is the part-time Private Secretary to Prince William and Prince Harry. Tom Pettiferis the son of Prince William’s former nanny, Tiggy Legge Bourke and also Prince William’s godchild. We can’t wait to see the designs!